Last week I taught my annual Kid's Camp at Honey Bee...and boy am I tired (so forgive my typos)! The week always comes with more than its fair share of "Holy cow, what was I thinking" moments, but it is definitely one of my favorite classes to teach! It is the only class where I have to repeatedly remind students to use their "indoor voices" and "walking feet" and say names 3 times before talking to students because they have been caught in a "blackout jinx" (don't ask...I think jinx has evolved). I also had to learn how to interpret the "language" they invented while waiting their turn for help (that'll teach me to move faster next time!) before I could even begin to understand the questions! We ate goldfish and had Disney singalongs while we sewed. We burned the ironing board, seam ripped and re-threaded more than I ever thought possible, cut things we weren't supposed to and created some wonderful (though slightly wonky) projects that will be loved forever because they were firsts. The best part of every camp is hearing the kids plan the projects they want to make when they get home and knowing that you have helped bring at least a few new sewers into the club. I meant to photograph all their projects because they were all so awesome and unique, but I only managed to take a few. I think that all of their quilts will be on the Honey Bee Quilt Store blog, but I'm not sure when. We made pillow cases, stuffed animals, zipper pouches, and quilts! I will probably have the quilt pattern available as a download as soon as I set up my Etsy pattern store front. I designed it specially for kids. It has few seams (and only a few long seams...attention span problems) and uses the fabric efficiently so there isn't a lot of over buying. 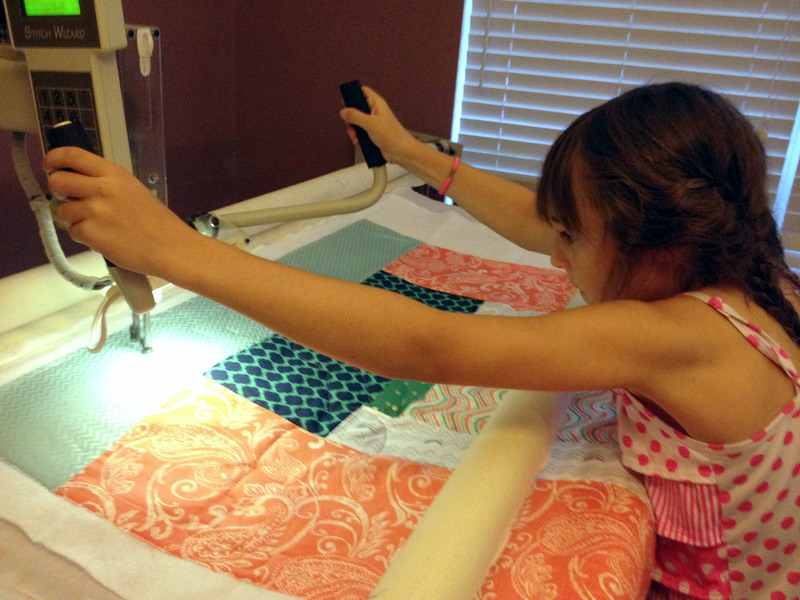 It also works well with all the unusual fabric choices kids tend to make. My bonus this year was having my friend Claire (the flower girl from my wedding) come stay for the week and go to camp! We sewed gifts for everyone she knew and I let her try her short arms at the longarm (hahaha...that was a lame joke, I'm sorry).